At the time of The Night of the Hunter’s release, the motion picture industry was in flux. Beset by the perceived threat presented by television, the studios were looking for ways to go bigger and better: color, advanced sound, widescreen aspect ratios, etc. Actor Charles Laughton, directing his first and only feature, opted to proceed in another direction. Instead of looking to the future for inspiration, he gazed into the past. The Night of the Hunter is an amalgamation of styles dredged up from as far back as the silent era. Combined into what was unique for a 1950s noir thriller, they included many common pre-talkie techniques (such as the iris), callbacks to German Expressionism, and nods to the “realism” of Cecil B. DeMille. The resulting film, a stylistic triumph, wasn’t popular with audiences of the day and only found favor many years later when viewed through the lens of elapsed time. Although The Night of the Hunter was underappreciated in the 1950s, it’s fair to argue it’s overrated today. Visually, the film deserves every accolade it gets. Some of its other aspects, however, including the decision to mimic the broad, over-the-top acting style of the silent era, don’t work as well. There are times when the production feels dated and even a little hokey. Dialogue is often ripe and the actors, especially Robert Mitchum, enjoy chewing on it. Moments of brilliance can’t entirely eclipse instances when things teeter on the brink of self-parody. The Night of the Hunter, despite a svelte 92-minute running time, offers two stories for the price of one. The first, a “danger on the inside” tale, is the forerunner of a narrative underpinning that would become popular in the ‘80s and ‘90s with films like The Stepfather, The Hand that Rocks the Cradle, and Single White Female. The second is a surreal road picture in which two children, fleeing danger, navigate a river with various odd and improbable waypoints. The film’s currency of shadows and contrast results in some striking images, such as one in which a horseman is silhouetted against a distant horizon and another in which a boat drifts along a river like a toy in a bathtub. The film opens with a short prologue in which a bank robber is shown giving $10,000 to his son, John (Billy Chapin), and daughter, Pearl (Sally Jane Bruce), along with strict instructions for them not to tell anyone about the money. He is captured, tried, and convicted. While awaiting execution, he shares a cell with a crazy minister, Reverend Harry Powell (Mitchum). Despite his best attempts to pry the information from the condemned man, Powell is unable to learn more than that the children know something. Once freed, Powell seeks out the widow, Willa Harper (Shelly Winters), woos her, and marries her – all in service of learning the location of the $10,000. John, however, doesn’t trust him and is unwilling to talk about the money. While the personality Powell shows to the locals is that of a pious, humble man, John glimpses the psychopathic serial killer who has left a trail of bodies in his wake. It isn’t long before Powell adds another victim: Willa. After slitting her throat and hiding the body in a river, Powell claims she ran off. John knows better, however, and he and Pearl escape via a skiff on a downstream journey through the wilds of West Virginia, seeking safe harbor. They find it with a kind old lady named Miss Cooper (Lillian Gish), who is known for taking in “strays.” But just as they are beginning to feel at home, Powell arrives in town, having followed their trail to its conclusion. The Night of the Hunter is presented from the children’s perspective, which is somewhat unique for a film of this era. This is evident in some of the more fantastical visuals, which emphasize how a child might perceive a setting, and in the almost supernatural qualities of Powell. Mitchum’s performance oozes malevolence and, as seen through John’s eyes, he is predatory from the beginning. His telling of the story of Cain & Abel, which is applauded by the adults, is greeted with wariness by John. In the end, Powell turns out to be just a man, as is evinced by the relatively straightforward manner in which he is dispatched. His deeds may be monstrous but he has no unnatural capabilities. In terms of casting, Laughton scored a coup by securing the services of Lillian Gish, the silent film starlet who had appeared in many of D.W. Griffith’s high-profile features, including The Birth of a Nation and Intolerance. Gish, now mature enough to play Miss Cooper, provided Laughton with a concrete connection to Griffith, whose style he appropriated for segments of The Night of the Hunter – most notably those in which Gish appears. 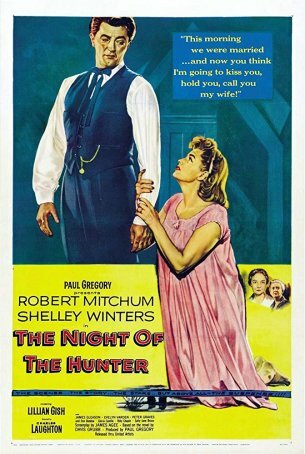 As arresting as Mitchum’s larger-than-life performance is and as pleasant as it may be to see (and hear) Gish 40 years after her first roles, no one would argue that the real star of The Night of the Hunter is cinematographer Stanley Cortez, who previously photographed The Magnificent Ambersons for Orson Welles. Asked to imitate German Expressionism by Laughton, Cortez crafted gothically unreal images and shadow-soaked scenes. There’s no way The Night of the Hunter could have been made in color; this is the purest example of the power of black-and-white. It has been asserted that the experience of watching The Night of the Hunter is different for children than adults. Younger viewers, less jaded and more attuned to “evil,” may be frightened by Mitchum’s portrayal and the claustrophobic tone established by the pervasive shadows. Adults, more logical in their reactions, may recognize that film’s stylistic mastery while acknowledging that some aspects are artifacts of a bygone era. Although The Night of the Hunter offers many pleasures for students of film history, its ability to captivate a generation for which its qualities are so foreign is as much an indication of how degraded film literacy has become as a counterargument to the movie’s timelessness.